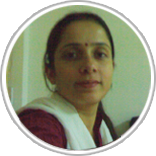 Sweaty Sharma, a researcher on genetics by profession done her PhD from prestigious IGIB in 2006. Being a research she loves to teach young students who are seeking admission for Medical program. She is having strong 15 years of experience in teaching biology. Sweaty loves to school students who are seeking admissions in medical studies, she clears the basics of Biology in such a methodology that her 9 out of 10 students secured admission in medical courses. Till date she have made 1000 plus dream true to become a medical graduate. Last Year she got 39 selections in AIIMS and 200 plus students in other state medical and dental colleges.